This bread has a pedigree! I picked up the recipe from David Lebovitz’ blog and he had adapted it from James Beard’s famous persimmon bread. By the time we have all adapted this recipe to our diets and taste buds, James Beard may never recognize its genealogy. Here we have no ordinary quick bread. I have never seen a loaf of quick bread disappear so quickly as this one does. The texture is dense, full of fruity flavors, and made crunchy with toasted walnuts. 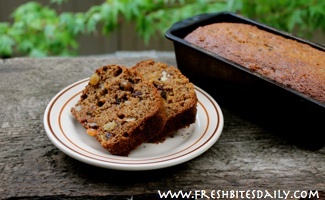 With the addition of whiskey, a slice of this persimmon bread may remind you a bit of fruit cake…but lighter in texture. We have made up this recipe using freshly ground spelt flour at times and Bob’s Red Mill Gluten-Free Baking Mix other times. Both work. The spelt is light and gives a good rise. The gluten-free flour does not rise as much, but enough to give the loaves as gifts. People wait for those gifts! Yes, indeed. For the dried fruit, I like a golden sultan raisin or diced apricots. Any dried fruit is delightful, but it is fun to play with the colors and shapes of DIFFERENT fruits. David Lebovitz recommends parchment paper in the bottom of the baking pans. Good idea! For some reason, this recipe tends to stick to the pan more than most. 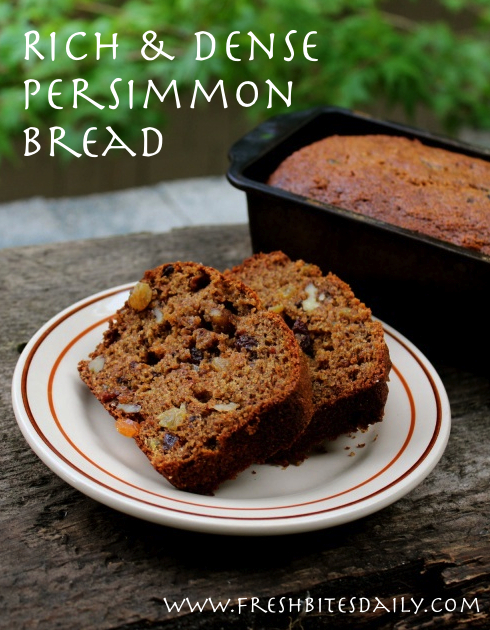 If you love this recipe and have access to a bounty of ripe persimmons, consider freezing persimmon pulp in 2-cup measures to easily enjoy this bread any time of the year. The following recipe makes 2 LARGE loaves — 2 x 9″ bread pans. Lacking that size, I make three 8″ pans and that works just fine. Work with what you’ve got! Butter 2 9″ loaf pans and line the bottoms with baking parchment cut to fit. Add the first five ingredients to a large bowl. Mix them together thoroughly using a wire whisk or a pastry blender. Mix the wet ingredients in a smaller bowl — the oil, eggs, alcohol of choice, and persimmon puree. Add one ingredient at a time, mixing thoroughly before adding the next. Toss the nuts and dried fruit into the dry mixture. Mix until all the nuts and fruit are coated with flour. Make a well in the center of the flour mixture and pour in the wet ingredients. Mix the wet and dry ingredients gently. Do not beat them! Divide the dough into your bread pans and bake for almost an hour. Start checking at 50 minutes. A toothpick inserted into the middle of the loaf should come out clean if the loaf is done. Persimmons! How to keep them from burning your mouth (and more)!